Croatia is an Eastern European country with a long coastline on the Adriatic Sea. Encompassing more than a thousand of islands, it's also crossed by the Dinaric Alps. Its inland capital, Zagreb, is distinguished by its medieval Gornji Grad (Upper Town) and diverse museums. The major coastal city of Dubrovnik has massive 16th-century walls encircling an Old Town with Gothic and Renaissance buildings. The dinar was the currency of Croatia between December 23, 1991, and May 30, 1994. The Croatian dinar replaced the 1990 version of Yugoslav dinar at par. It was a transitional currency introduced following Croatia's declaration of independence from the Socialist Republic of Yugoslavia. 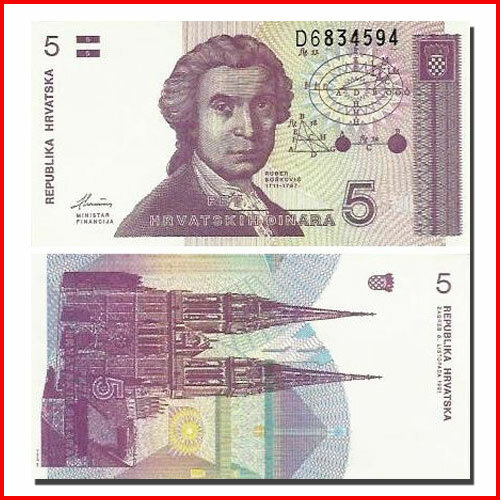 The modern and the current currency in use in Croatia, “the kuna”, was introduced on May 30, 1994, starting a transitional period from the Croatian dinar, ending on December 31, 1994. Obverse: Vignette of Roger Boscovich and his name with lifetime at centre with geometrical calculations at upper right also Coat of arms at top right corner. Republic of Croatia written in Croatian at left with signatory of the Minister of Finance at lower left. Prefix and serial number at upper right. Numerical denomination at the top left corner and lower right with the denomination in words in Croatia at the centre bottom. Reverse: Zagreb cathedral and artistic rendition of city buildings behind on vertical back. The Republic of Croatia in Croatian on left and Coat of arms at the bottom left. Numerical denomination at the bottom left corner and upper right with the denomination in words in Croatian beside it.